Unlike the complicated configuration and installation of traditional cameras, the new mini PTZ network camera only takes a few minutes to set up. Quick installation design provides three simple and flexible installation methods such as mounted on the surface of ceilings, walls, and even tripod. After that, it is fast to set up the mini PTZ camera by Wi-Fi connection. Just connect it via wire and scan the code on it by a smartphone app, then the video would be output immediately. Uniview’s mini PTZ applies new anti-reflection glass, which not only can increase infrared transmittance by 8% but also improves the average light compensation performance for the video and effectively avoid regional overexposure. Furthermore, the mic is built on the Pan-Tilt. It moves along with the camera, which ensures to collect clear audio all the time. The 5MP mini PTZ model features super starlight, which can present a crystal-clear image with a minimum of 0.0005 lux illumination. Meanwhile, it is able to provide a detailed image by applying 120dB True WDR which can fix any overexposed and dark scene then creating the most balanced ultimate picture. 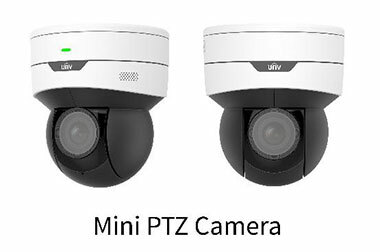 Besides, mini PTZ cameras utilize 5X 2.7~13.5mm optical vari-focal lens which is capable of demonstrating wider and farther view, and it also has the same ability with PTZ dome cameras that consistently produce focused, clear images during zooming, so users will not miss any information during the zoom.